The stress involved in getting a blouse stitched is too real. From finding good quality fabric, leaving it in the hands of a (hopefully) trustworthy tailor, harassing him every two days (“Bhaiya, abhi tak nahi banaya!”), and taking multiple trips to the boutique in hopes of the perfect fit - it’s all too demanding and way too tiring. Luckily for you, we’ve gone and found the perfect solution. 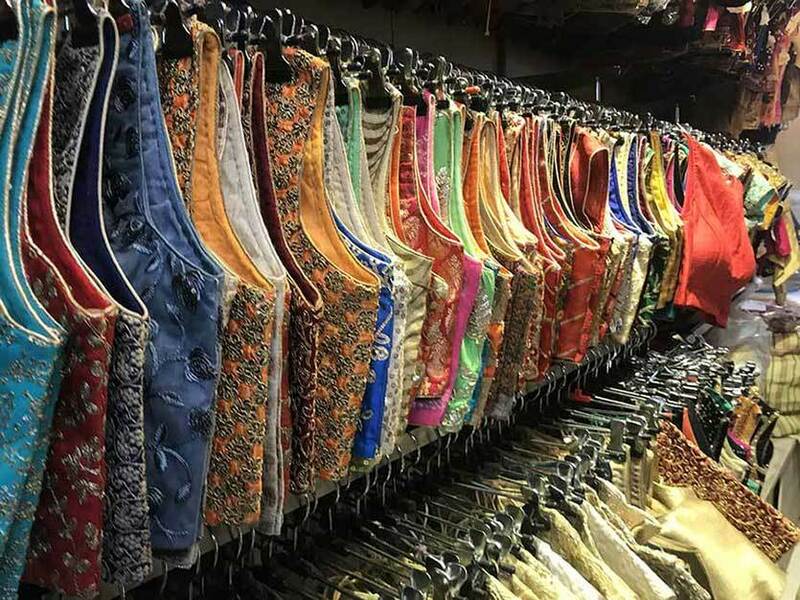 Say hello to a whole array of shops in GK I’s chic M Block market that’s hell-bent on providing you with a large variety of readymade blouses. Unsuspecting stairs lead to a basement that houses a cornucopia of tailors specialising in blouses of every kind (but since it’s quite easy to miss, a simple reference is that it’s just a few steps ahead of the Color Plus store). Be it an emergency event that demands you must drape the holy nine yard cloth but your old blouses have backstabbed you ever since you binged on that mithai during Diwali, or tailor Bhaiya’s uninformed leave of absence to his village - sweat no more! And the best part is that one blouse could easily compliment both your grandmother’s vintage saree or that new trendy ghagra - there’s lots of room to be creative and to mix-and-match to your heart’s content! After a long, observant walk through this treasure trove of a basement and detailed questioning of multiple tailors, we’ve put together the holy grail of a tailors’ list for you. So the next time your mom’s sister’s daughter’s brother-in-law is getting married, you don’t need to repeat the same old outfit (because we understand that you’ve already put up a Facebook DP wearing it). #NewShaadiNewKapde has never been easier! With a large variety of blouses ranging from raw silks, brocades to embroidered ones, Buttons and Bows has a few even cuter than its name! Prices range from a reasonable Rs 900 upto a whopping Rs 8,000, so there’s a whole range for you to take your pick from. They have a few standard sizes always available, or of course, customization can be done at a short notice as well. 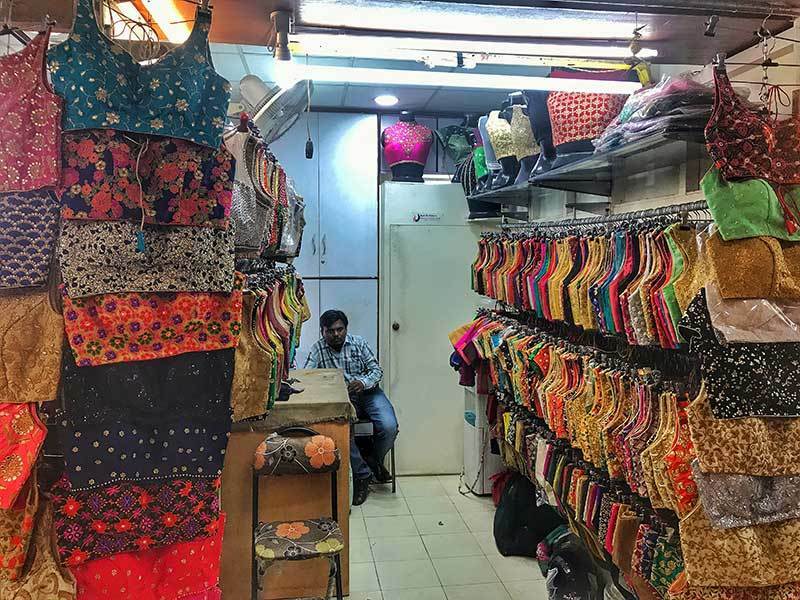 An oldie and one of the most-patronized in this specialised blouse market, Roshan Tailors is your one-stop-shop - literally. Aisles of blouses in every colour (and colour variant) imaginable, looking through the shelves here is like scanning a large paint catalogue. 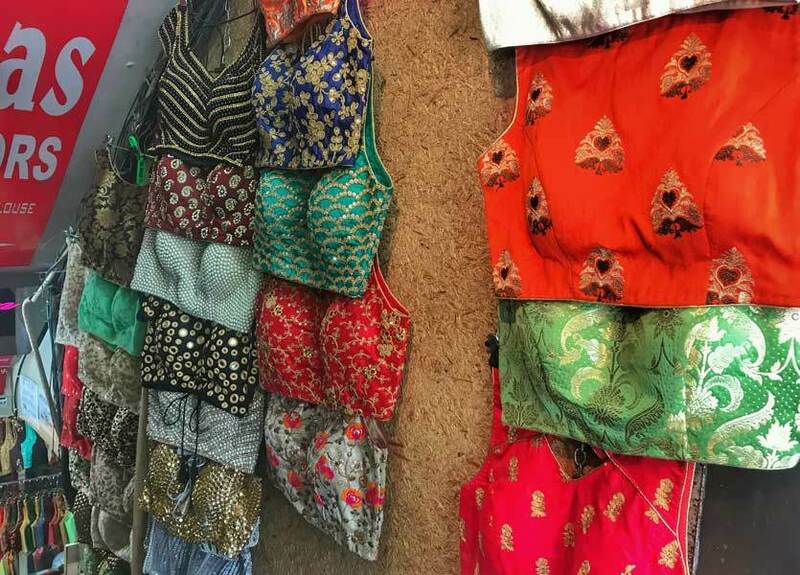 With prices starting at Rs 1,000 and going up to Rs 4,500 for readymade blouses, depending on the fabric, quality, and embroidery, it’ll be hard for you to pick just one! We also spotted a row of colourful blouses in eclectic Rajasthani embroidery, priced at Rs 1,800, perfect to quirk up any old outfit. Right where the stairs to this mysterious basement end, you will find Libas Tailors. Prices for readymade blouses start at approximately Rs 800 - 900, and can go up to five to six times that amount. Bursting with options in hundreds, both traditional and trendy, you’re bound to find something that catches your eye and flatters your figure. Net, chiffon, georgette, embroidery, sequins, glitter - you name it, they have it. Add the ‘oomph’ factor to your mom’s old saree and pick something that screams YOU! With an already existing massive variety and customizations readily available, it’s safe to predict that you’ll be spoilt for choice here. You can find blouses for as little as Rs 700 here, but they also have options if you’re looking for something a little more extravagant. Another popular shop with a large, loyal clientele, Eve’s Tailor will satisfy every demand you could ever cook up. From corset blouses and cape-style cholis to pair with your lehengas, or very detailed, very specific Pinterest-inspired necklines and back cuts, you are in trusted hands. And in case you run out of ideas, they will hand you a thick catalogue to browse through and decide what best suits your style. (P.S. - This isn’t part of the same basement, but a few shops ahead. Since it’s an extremely popular stop, ask around and locals will happily lead you to it). 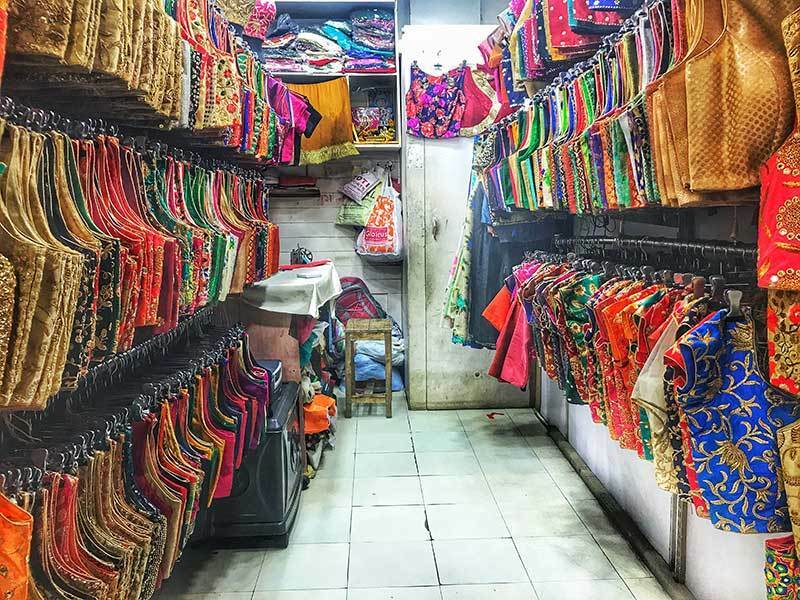 If readymade isn’t quite your style and you prefer to have your blouses stitched to perfection, then all these shops shall aid you with that as well! It would be best to give them your order well in advance, since many of them refuse to take additional orders if they already have a lot on their plates. You can give them your own fabric, or request them to source it for you. Charges vary depending upon the styling, of course, but you can be guaranteed of attention to detail and a good finish by these experienced tailors. Since the shaadi season’s just around the corner (Oh, who are we kidding? It’s always shaadi season in apni Dilli! ), we’ve got you covered! Blouse wali bustling gali, always to your rescue!